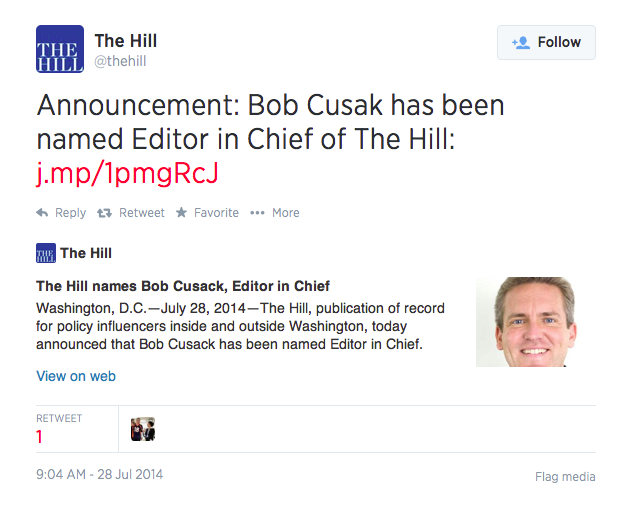 The Hill today announced that Bob Cusack has been named editor in chief. He’s served as managing editor of the paper since 2004. Cusack’s promotion came with several other announcements, including the departure of Hugo Gurdon who’s heading to The Examiner. Hill news editor Ian Swanson will replace Cusack as managing editor, and business and lobbying editor Dustin Weaver will fill Swanson’s role. 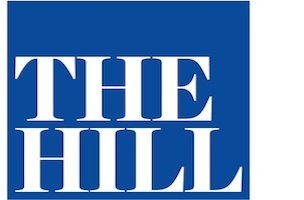 POLITICO’s Scott Wong will now serve as a senior staff writer for The Hill. At 9:04 am, The Hill tweeted the announcement (to the right), and funny enough, misspelled his name (thank you Fishbowl reader for the screen grab!). The tweet has since been deleted and a new tweet issued, spelling corrected (below). For more on the promotions and hires, including those on the business end, click on over to The Hill.